What’s small, jazzy pink, and always makes an appearance on the party crudité platter? Radishes! This root vegetable is part of the Brassicaceae family, alongside other members like broccoli, cabbage, cauliflower, turnips, and kale. They can be pink to white, soft to firm, sweet to peppery, round to elongated (get the picture? )–radishes take on a variety of shapes, colors, textures, tastes, and sizes, but the common radish we know and love walks the line between sharp and sweet, is wrapped in a bright pink skin with crisp white flesh, and is normally no larger than a golf ball. Since they’re making their in-season appearance at a supermarket near you, we think it’s the time to stop side-lining our little radish friends. By learning more about them and their unique varieties we’ll show you how to get them off that crudité platter and onto your plates in new ways. What’s your favorite recipe with radishes? Tell us in the comments, and upload a picture of your creations for all to enjoy! Wild radishes, the ancestors of our modern-day varieties, are thought to have originated in Southeast Asia, and later spread to India, China, and Central Asia before being domesticated by the ancient Greeks and Romans. Nowadays, there are many varieties cultivated worldwide. 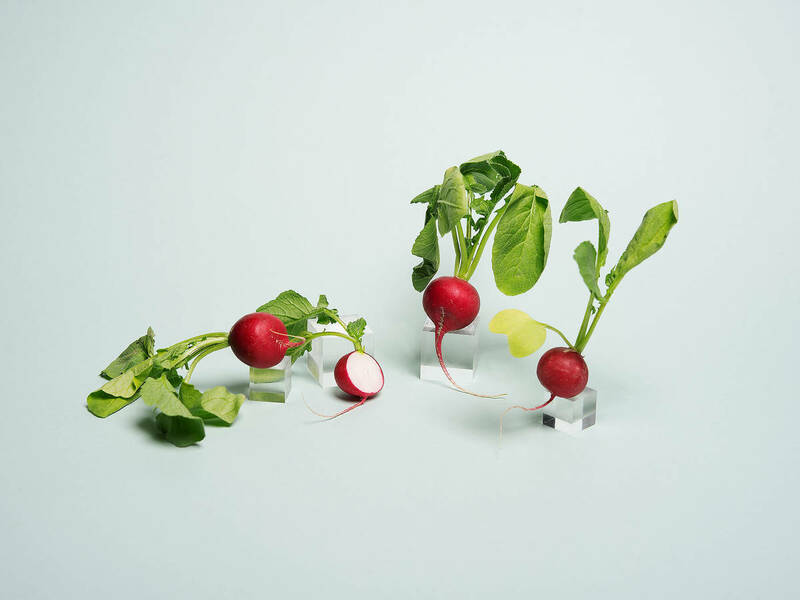 Radishes owe their distinctive sharp bite to the colorless oil “allyl isothiocyanate” that’s also present in mustard, horseradish, and wasabi. There are nutritional benefits too: With a detoxifying effect that’s good for your digestive system, they can also kill the bad bacterias and fungi that might be present in the stomach and bowels. Radishes are cultivated between May and October, but those grown in greenhouses can be harvested all year round. When buying radishes of any kind, you should make sure that the leaves look fresh and green, the bulbs are not too big but heavy for their size, and the skin is smooth and taut over a firm bulb. If possible, you should remove the leaves and the stems when storing radishes at home, as they absorb water from the bulbs and can cause them to wrinkle and soften. The leafless bulbs can remain fresh for about two weeks when stored in a plastic bag in the vegetable compartment of your fridge. However, if your radishes do become wrinkled, simply soak them in a bowl filled with water for half a day and they should regain their classic crisp texture and smooth skin. Hey, what about those leaves? Don’t throw them away! They can be blended into juices, simply sautéed as a side, or mixed in with salads and soups. Preparing radishes is unbelievably simple, simply wash and they are ready to be used! Most often they are eaten raw as a crudité or crunchy topping for salads, but they can also be cooked or pickled. Though the bright pigment may fade when cooked or pickled, and the texture and flavor are also likely to change–becoming softer and milder with cooking, even crisper and more pungent when pickled. Pickled daikon radish is a common Korean side often served with fried or grilled meats, while other types of quick pickled radishes make great add-ons for all types of dishes from burgers, chilis, sushi to tacos.